In a previous posting (“Are You Ready For Tornado Season?”), the issue of tornado safety was explored, including a primer on how tornadoes form and the potential damage and risk to humans they present. But did you know that there are other weather-related events that closely resemble tornadoes? While these wind-based cousins of tornadoes vary in strength and potential for creating a threat to humans, they warrant a primer. This is because all extreme weather events- regardless of their seeming banality, can pose a risk to property and people. Waterspouts are weather events that are most directly-related to tornadoes. In fact, waterspouts are generally divided into 2 general types, tornadic and fair-weather waterspouts. Tornadic waterspouts are true tornadoes which have either formed over a body of water, or have formed over land and mover a nearby body of water. Tornadic waterspouts have the same origin dynamics of land-based tornadoes in that they form from the rotation present in an organized supercell thunderstorm that contains a rotating mesocyclone. They form within a rotating wall cloud, and extend to the water (or ground), and—depending on their individual strength and intensity—are capable of producing any level of damage and risks to human life any other tornado. Fair-weather waterspouts (also known as “non-tornadic waterspouts”) are the other type of waterspout that are, in fact, far more common that tornadic waterspouts. Fair-weather waterspouts occur in coastal waters and are associated with dark, flat-bottomed, developing beneath cumulus towers (clouds). Waterspouts of this type rapidly develop and dissipate. 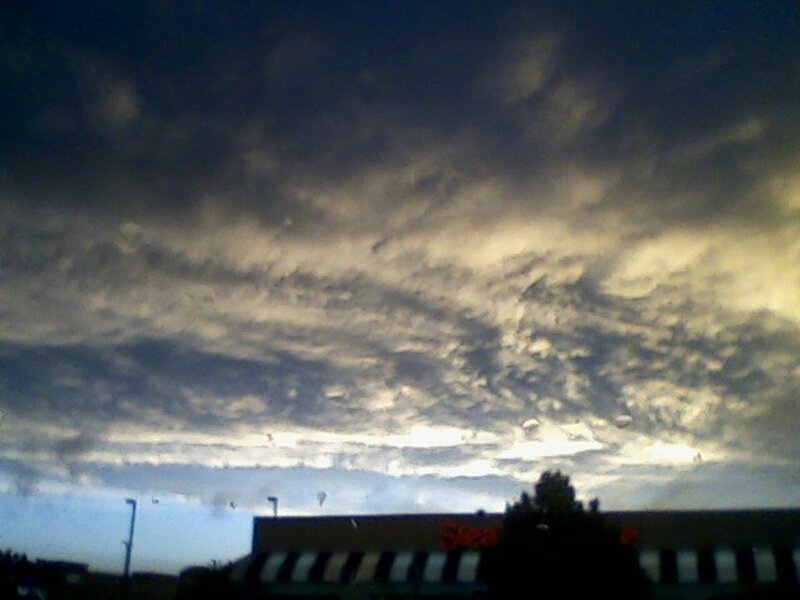 They are characterized by the fact that they are not associated with a rotating updraft of a supercell thunderstorm. At this point, the waterspout begins moving across the surface, generally slowly but speeds up to 80mph (130kph) have been recorded. Wind speeds within the spout are typically between 60 and 120 mph (95-195kph), strong enough to be destructive but not devastating. The height of the column is generally less than 300ft (100m), but can reach heights of 2000ft or 600m. Non-tornadic waterspouts rarely exceed 100ft (30m) in diameter. 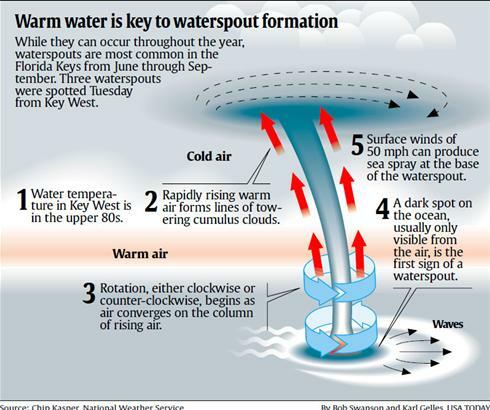 What’s more, apart from the spray at its base, the funnel of a true waterspout is not composed of water but is outlined by water vapor formed as pressure drops and evaporative cooling takes place. In most cases, waterspouts which make landfall are much weaker than true tornadoes. 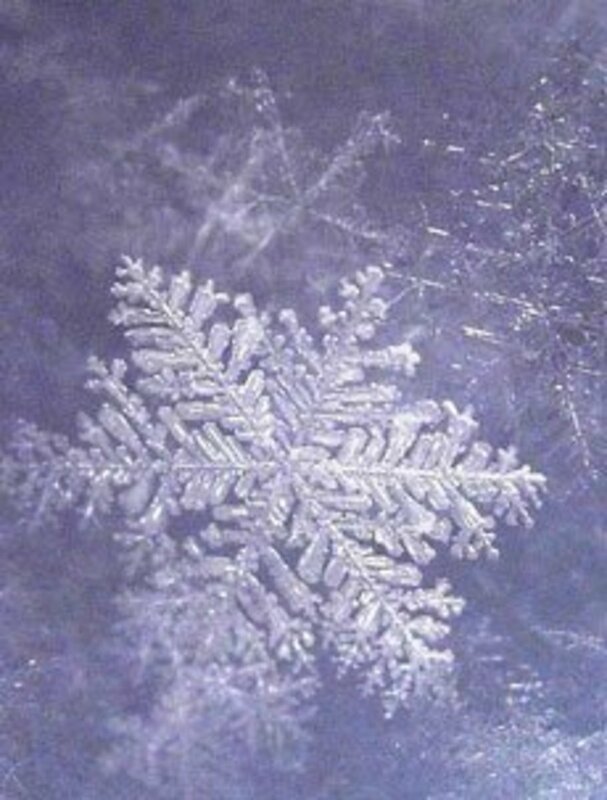 They tend to produce little or no damage, and dissipate quickly. Once on land, they tend not to be a great threat to life and property. However, in rare cases, stronger waterspouts may produce significant damage when making landfall. These waterspouts can be a significant threat to life and property. In these cases, the National Weather Service (NWS) will generally issue a Tornado Warning. 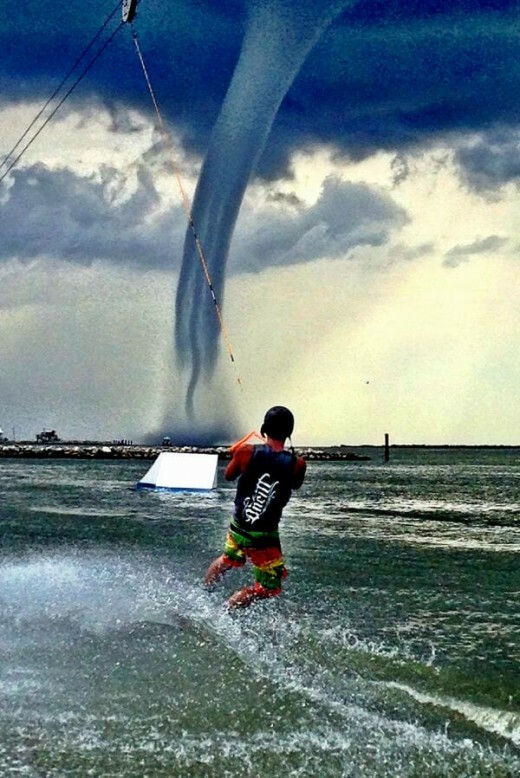 Waterspouts should be taken seriously. Anyone engaging in routine boating, or individuals living along the coast of Florida or the Great Lakes you should be aware of their destructive potential. When warnings are issued for waterspouts (in the form of Special Marine Warnings), be prepared to quickly seek safe harbor, or to find shelter out of the path of the waterspout. 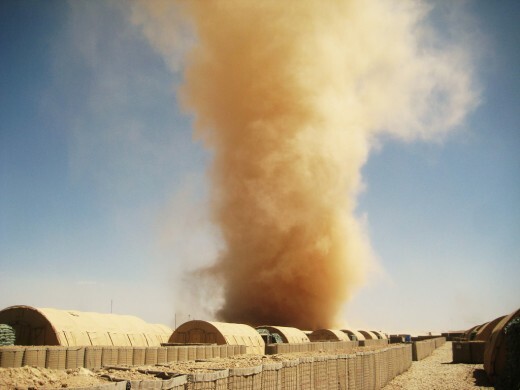 A dust-devil is a relatively small and somewhat well-developed whirlwind of focused air, rendered visible by the accumulation of dust, sand, and debris picked up from the ground by the phenomenon. These active wind columns form when the ground surface heats up, and a small disturbance to the overlying layer of hot air causes it to rise and begin spinning. As velocity of the resulting swirling air increases, the dust-devil picks up dust and sand and carries it aloft in a small whirlwind. A generally infrequent occurrence, dust-devils can vary in size, strength, and duration. While some can last as brief as a minute, others can last for upwards of 20-minutes. What’s more, the size of dust-devils can range anywhere smaller-sized vortexes of about 3 ¼ feet (1 meter) wide and 10 feet (3 meters high, to larger funnels that can expand to 100 feet (30 meters) wide, and up to 650 feet (200 meters) tall...or even higher in a few rare cases. Flat barren terrain, desert or similarly and easily heated ground - Flat conditions increase the likelihood of the hot-air "fuel" being a near constant. Dusty or sandy conditions will cause particles to become caught up in the vortex, making the dust devil easily visible. 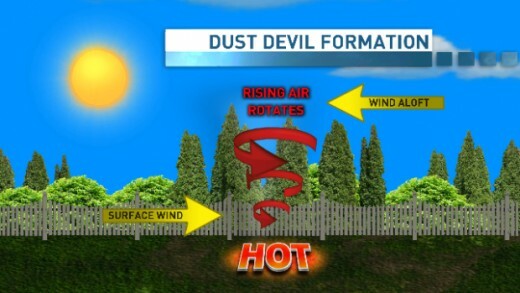 Clear skies or lightly cloudy conditions - The surface needs to absorb significant amounts of heat from an unobscured sun in order for the air near the surface and create ideal dust devil conditions. Light or no wind and cool atmospheric temperature - The underlying factor for an extended life-cycle of a dust-devil is the extreme difference in temperature between the near-surface air and the atmosphere. Windy conditions will destabilize the spinning effect (like an actual tornado) of a dust devil. Dust-devils aren’t the same as actual tornadoes, which form by slightly different processes. Dust-devils differ in that tornadoes form primarily—but not exclusively—from organized clusters of severe thunderstorms, that in turn form along active weather fronts. Additionally, dust-devils don’t get nearly as big or as destructive as tornadoes can get. However, strong dust-devils can potentially create damage equivalent to an EF-1 rated tornado on the Enhanced Fujita tornado damage rating scale (see: “Are You Ready For Tornado Season?”). In East El Paso, Texas in 2010, three children in an inflatable jump house were picked up by a dust devil and lifted over 10 ft. (3 m), traveling over a fence and landing in a backyard some 3 houses away. In April of 2016, a dust-devil near Draffenville, Kentucky produced a damage path of between 200-250 yards (182-228 m) in length, and some 50 yards (45 m) wide that stripped metals sections of a roof off a barn, and ripped small branches off of trees. And on extremely rare occasions, dust-devils have resulted in injuries—and fatalities—when they are particularly strong. On May 19, 2003, a dust-devil lifted the roof off a two-story building in Lebanon, Maine, causing it to collapse and kill a man inside. And in June of 2008, a dust devil in South Dakota caused a shed to topple over, killing a female airline pilot who had taken shelter there during a particularly strong event. Authorities believe that the estimated 60-to 80-mph (96-to 128 kph) winds in the dust-devil blew into the open windows of the shed, caught under the roof and created a large enough amount of pressure to lift the shed off the ground and topple it on its side. Though typically not considered a major real threat, dust-devils can occasionally—under certain extreme conditions—result in indirect injury to those who suddenly find themselves in their paths. A landspout is a kind of tornado not associated with the mesocyclone (a cloud/storm structure that generates rotation) of a thunderstorm. 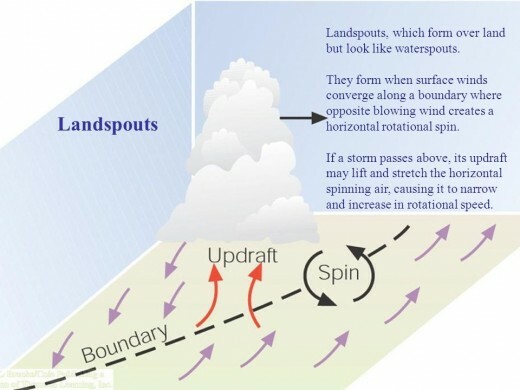 Structurally, landspouts differ from tornadoes in that they are semi-visible vortices of wind that form from non-supercell thunderstorms (thunderstorms characterized by a rotating mesocyclone that often gives rise to actual tornadoes). Additionally, landspouts are not associated with the characteristic low-hanging wall clouds by which true tornado funnels emanate from. On the contrary, landspouts form most commonly under large, actively growing cumulus clouds or weak thunderstorms, as opposed as directly from their base like in actual tornadoes. However, like waterspouts, landspouts are also technically considered tornadoes since they are defined by an intensely rotating column of air in contact with both the surface and a cumuliform cloud. Visually, landspouts are characterized swirling dust, may have a weak condensation funnel reaching up to the cloud base, and can be occasionally destructive. While true tornadoes form from top down (as rotation within the mesocyclone inside the cloud produces a funnel cloud that extends down to the ground), a landspout forms more from the bottom up. There is no overall rotation inside the cloud, thus no mesocyclone to be picked up on radar. There's no wall cloud hanging of funnel extending down beneath the storm cloud to give away the potential formation to landspouts. There is usually only a small funnel seen just beneath the cloud base, with the top of the funnel being invisible. But as with true tornadoes, there is an accompanying swirl and debris (composed of dust, dirt, and various man-made objects pick up and blown along the way at the base of the spout. However, not all landspouts are visible, with many only being apparent as debris begins swirling at the surface of the ground…before eventually filling in with a visible condensation and dust. As the name implies, landspouts are the land-based equivalent of waterspouts, as they resemble their water-based cousins in both appearance, and in the fact that they tend to form underneath organized storm clouds rather than extend from them. Landspouts most often occur in drier areas with high-based storms and considerable low-level instability. Thought they are generally smaller and weaker than true tornadoes, some have produced upwards of EF-2 level damage. In these extreme cases, they can generate winds over 100 mph (177 kph). In June of 2016, a landspout struck a section of the coastal the town Bouge, North Carolina, where it caused damage that included picking up and tossing an 18-foot boat on a trailer onto the porch of a home. The storm also caused some collateral damage to homes and vehicles in the area. In most cases, landspouts rarely last longer than 15 minutes in total duration, so overall damage tends to be limited to small areas. The absence of supercell (severe) thunderstorms in the formation of landspouts often results in another major difference between landspouts and traditional tornadoes. Landspouts and their parent storm clouds produce little or no lightning. This means that landspouts produce one less hazard for those in the path of these storms have to face when they occur. Landspouts can form anywhere in the vicinity of severe thunderstorms, so those in the vicinity should be aware of the possibility of these and other threats that can be generated out of such storms. In some cases, the NWS will issue a severe thunderstorm warning whenever the risk for high-wind producing storms—capable of generating events such as landspouts—are imminent or is occurring. In such instances, the same precautions one would take to avoid severe thunderstorm hazards should be observed during an increased risk for landspouts. A gustnado is localized spinning windstorm comprised of a vortex that emanates from the gust front of strong thunderstorms. The name “gustnado” is actually an amalgam of the phrase, "gust front of a tornado." 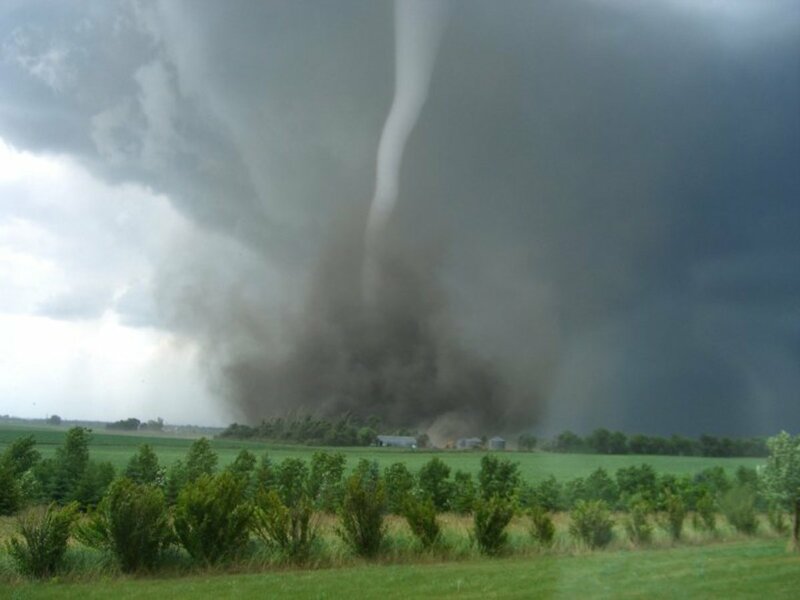 And though a gustnado resembles its more well-known, more destructive cousin, it is not considered a true tornado. For one thing, a gustnado does not develop in the same way that a classic tornado does. Like tornadoes, gustnadoes form from strong thunderstorms. But that is where the developmental similarities end. In the case of gusnadoes, the thunderstorms involve will produce a powerful downward push of air called a downdraft. 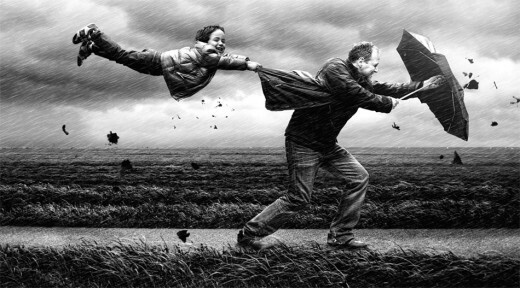 The downdraft winds then spread outward upon hitting the ground, causing a strong rush of wind at the surface. If there is enough instability, rotation may develop and a gustnado might form. 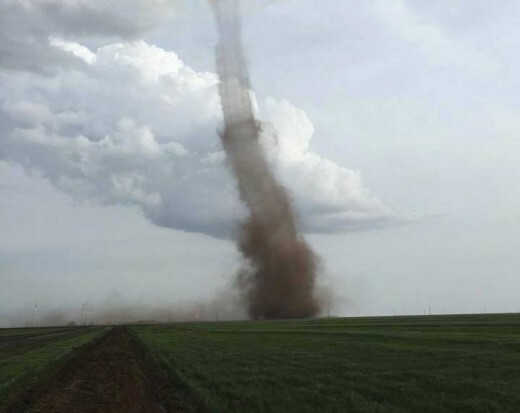 Unlike tornadoes, gustnadoes spin upward from the ground, extending an average of 30 to 300 ft (9 to 91 m) above the ground (instead of being connected to the ground from the base of a wall cloud, making it different from tornado). 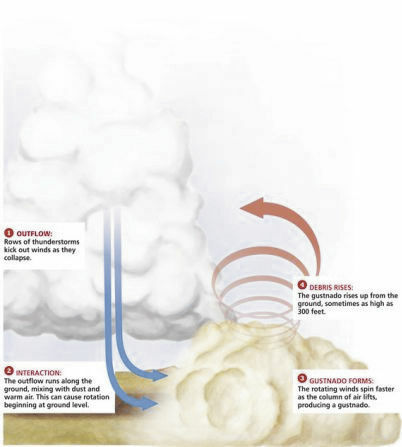 Appearance-wise, gustnadoes appear as somewhat cylindrical condensation clouds that are actually –compared to actual tornadoes—weak wind vortexes—where their bases send dust, dirt, and small objects swirling aloft in a cloud of debris that makes it appear somewhat like a tornado in appearance…but rarely connect to a cloud base. And though there is sufficient debris or form condensation cloud to be visible, it is the wind that makes the gustnado comparable to a tornado. As these wind eddies very rarely connect from the surface to the cloud base, they are very rarely considered as tornadoes. The average gustnado lasts a few seconds to a few minutes, although they can often form in simultaneous swarms. Most tend to generate the wind strength equivalent to the power of an EF-0 or EF-1 tornado, with potentially damaging winds of between 65 and 100 mph (104 and 160 kph). Gustnadoes typically stay close to the ground, and their vortex “funnels” can range anywhere from 50 to 300 ft (15 to 91 m) in height. As they can vary in strength, they can also vary in both intensity and the potential damage and threat to people they are capable of causing. In rare cases injuries or death occur. On August 13, 2011 a music stage at the Indiana State Fair collapsed as a gust front from storms 10 miles (16 kilometers) away hit the area. The collapse killed 7 and injured 43. Some meteorologists believe a gustnado actually hit the stage. Gustnadoes can form anywhere in the vicinity of severe thunderstorms, so those in the vicinity should be aware of the possibility of these and other threats that can be generated out of such storms. In some cases, the NWS will issue a severe thunderstorm warning whenever the risk for high-wind producing storms—capable of generating events such as gustnadoes—are imminent or is occurring. In such instances, the same precautions one would take to avoid severe thunderstorm hazards should be observed during an increased risk for gustnadoes. 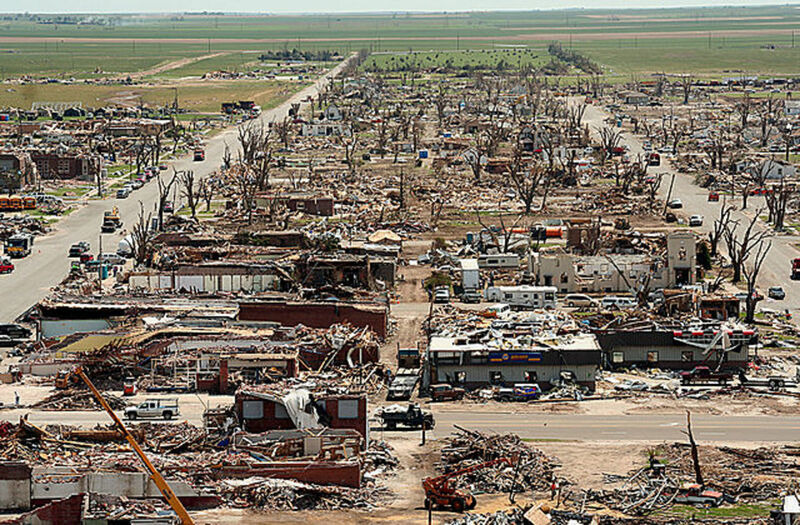 While this group of spinning columns of wind, dirt, and/or water lacks the huge destructive power of the larger tornadoes, they all can potentially cause damage and injury. 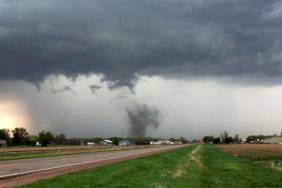 Those associated with tornado forming conditions—namely severe thunderstorms—are best avoided. 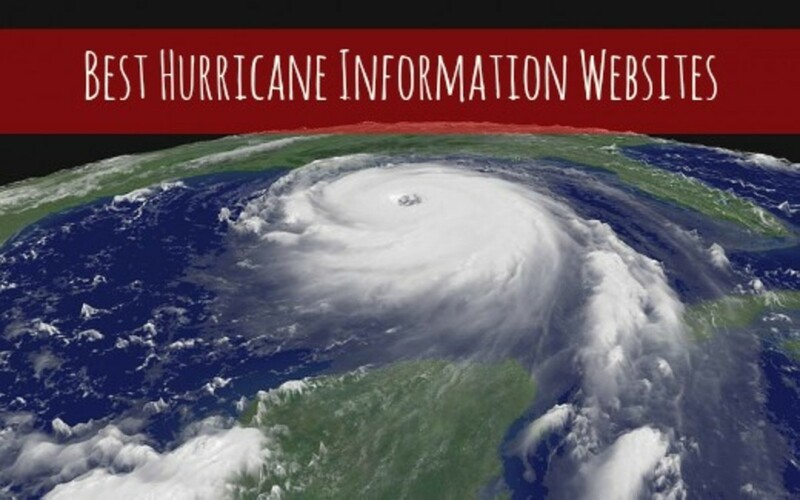 More to the point, being aware of changing weather conditions as well as one’s surroundings, is the best way to prevent being affected by such wind-based weather events. If you've liked what you read here, please feel free to donate to help offset the costs of future publications.